Today is the first day of the July session of my Organize Your Paper Clutter online class. (Update: Organize Your Paper Clutter is now available as a self-paced online class.) So I thought it would be fun to share a little paper organizing project — a simple coupon organizer. You might remember that earlier this year, I went to the Get Organized St. Louis Organizing Expo. One idea I flipped over was this simple coupon organizer that professional organizer Julie Hough shared with the group. I was inspired to go home and make one myself. Before I get into the details, I have to share that I’m the opposite of an extreme couponer. I love to use coupons for clothing purchases, eating out, craft purchases (Michael’s, Archivers, etc.) and I’ll use some of Target’s coupons. But that’s about it. 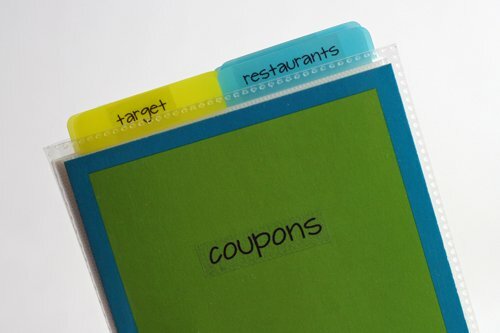 I have tried quite a few coupon solutions in the past, such as a 3-ring binder. This was overkill for me. I was excited about it when I put it together, thinking that a fun, coupon organizing binder would inspire me to change my coupon habits. But it didn’t. Not at all. Before that, I used a small accordion file for my coupons. And…I didn’t like it. It shouldn’t have surprised me, really, because I don’t like bigger accordion files either. It’s just find it too hard to get stuff in and out…and papers kind of disappear when I put them in an accordion file. My favorite solution for coupons, to date, was a single file folder that I kept in the file basket on my kitchen counter. The biggest downside to that system was that it was almost too easy to file coupons…so coupons would get pretty out of date rather quickly. And this system wasn’t portable for me because my purse isn’t large enough to hold an entire file folder. Step 1. Collect your supplies. Step 2: Organize your coupons and decide on categories for your organizer. 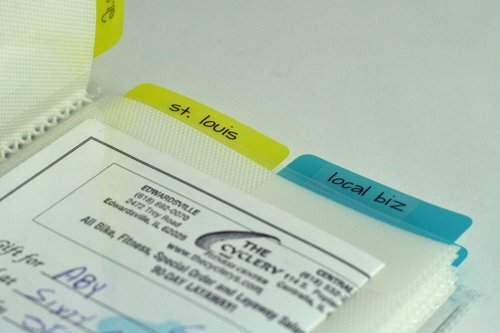 Step 3: Print labels and adhere to tabs. I also printed a label for the front cover. 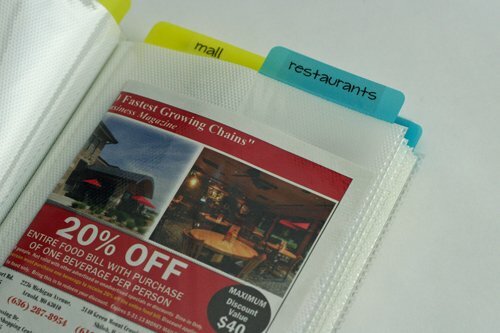 Step 4: Attach tabs to photo album and put away your coupons. Step 5: Remember to tuck your coupon organizer into your purse when you shop! Or, if you have a big enough purse, you could store your coupon organizer right in your purse and always have your coupons when you need them. So that’s all there is to it! Thanks again to Julie Hough for inspiring this simple and fun organizing project! And now…I’d love to hear from you. Are you a big-time couponer or a moderate coupon user like me? 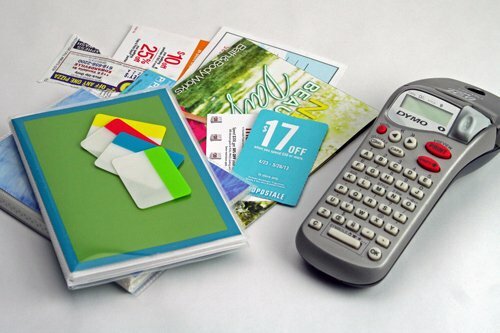 What works for your when it comes to organizing coupons? Thanks so much for sharing your ideas! I really like this idea because of the same things you point out about why it works better for you. One question I have is do you split up the coupons into a few pockets when there is quite a few for one category? For example, if you have quite a few Target coupons, do you utilize a few pockets? I do have more than one page for some of the bigger categories. And I can move the tabs…if necessary to spread things out later if I find a category needs more room. This is brilliant I am adding it to my to do list! I like to coupon but haven’t hit on a good system for non grocery coupons! And gift cards! Thanks for sharing. My grocery coupons are in a binder in page protector by date. Before I go shopping I check a coupon database to see if there are coupons for what is onmylist. Thanks Alissa! Glad you like it. Your grocery coupon organizing sounds great! Thanks for sharing your system. What a great idea! I am anything BUT a “couponer.” But that’s mainly because I have never found a good method for organizing them. I may now re-think things. I’d love to hear what you think if you give this one a try! I do use grocery coupons so I have a system for those (currently using a My Coupon Keeper (http://www.mycouponkeeper.com/) because I won it in a blog contest). Before I got that, I tried the binder and that just didn’t work … too heavy, didn’t fit in the shopping cart, a pain to keep sliding coupons in and out of the little baseball card slots. And before all that, I tried those little accordion file folders, too. Great in theory, but, like you said, hard to get stuff in and out. It was cute, though, so I wanted to find another use for it and ended up turning it into something similar to what you did here. I’d already labeled the tabs A-Z, so I use them to keep track of stuff by store name … gift cards, coupons (like those wonderful Kohl’s 30% off ones) and also the discount cards (like Jewel/Osco). It’s great because whenever I’m at a store, I can check the correct slot to see if I have any of the aforementioned for that particular store. Can’t tell you how many times over the years that I’ve purchased something and later realized that I had something that I could’ve used to save a little more. This solves the problem since it’s small enough to keep with me always. Love systems that work! That sounds like a great way to use your accordion file. Thanks for sharing the idea! I would be afraid that the sleeves would rip too easily on the photo book. I use an organizer called The Couponizer. 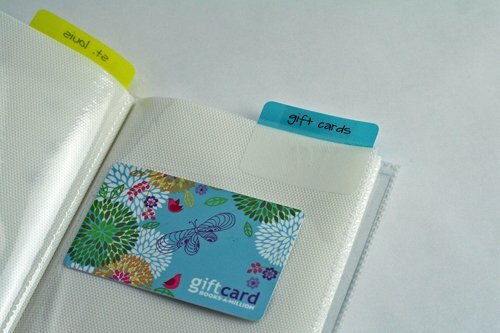 It has lots of space for your coupons, including a spot for the coupons you plan to use on your shopping trip, a place to put the ones you are actually going to use at the register and a place for all the ones expiring in the current month. Plus slots for rewards cards, restaurant coupons, shopping list. AND it has a fold out sorting sheet which really speeds up the filing process. It’s perfect for someone like me who cuts Sunday coupons and occasionally prints them off the Internet. A big binder would be overkill for me. But the Couponizer is just right. And it fits in my purse. That looks like a neat product – thanks for sharing it. I hear you on the sleeves ripping – so far so good. And the one that Julie had looked like it had been used for a while. I figured for $2 it was worth it to try it for a while and see if it holds up okay. Love it! I love how you took Julie’s fabulous idea and made it your own. Love this idea I have a set up for grocery coupons but I always lose track of these kind of coupons. I use the brag book for all of my gift cards and coupons. My children’s school fundraises using Scrip (purchasing gift cards at face value and the school makes a percentage off each card purchased), so I have them for every store and restaurant that I patronize. I use a separate sleeve for each store and add the coupons that I plan on using at the store in the same sleeve. It’s been working great. I have used it for about a year and no ripping yet. I use about 3 coupons per year, mostly because I never remember to take my coupons with me when I go out shopping. I decided today, as I sorted through 20 different diaper coupons (half of which were already expired), that I need a coupon solution. And of course Aby has one that looks simple, easy, and best of all FUN. So this is my quick and simple weekend project for the week. Thanks, Megan! I hope this works great for you! !